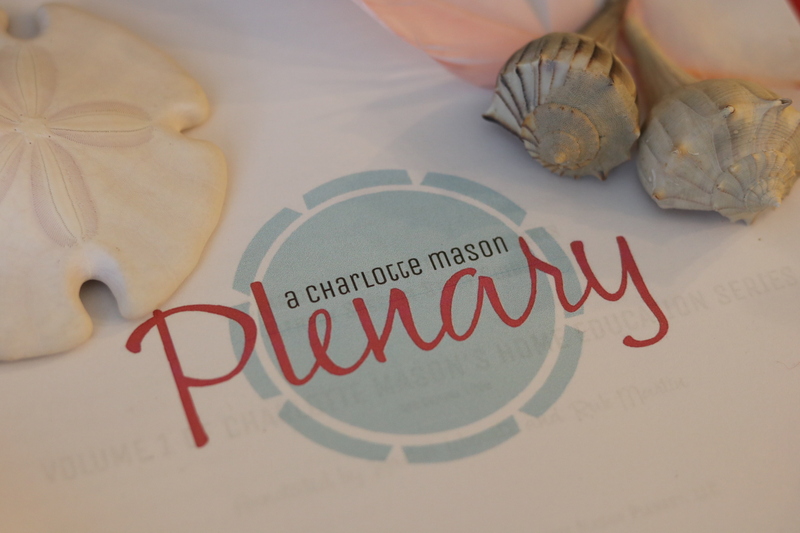 A few months ago I introduced you to A Charlotte Mason Plenary and I told you about their lovely annotated version of Charlotte Mason’s Volume 1. You, of course, took my advice and headed over there and are now walking around with Volume 1 under your belt, right? Not to worry if you didn’t…you’ll be able to pick up a copy of their annotated volume from their website soon. Or you can jump in on the Plenary Session for Volume 6 beginning later this summer. In my original post about the Plenary, I also voiced my excitement over all the projects they have in the works. Just today I saw the announcement that they’ve now released their first artist study on Vermeer. But that’s not what’s got me excited! I’m excited to announce that they have just released one of my now favorite CM help guides. It is their first Plutarch guide (with another soon to follow). 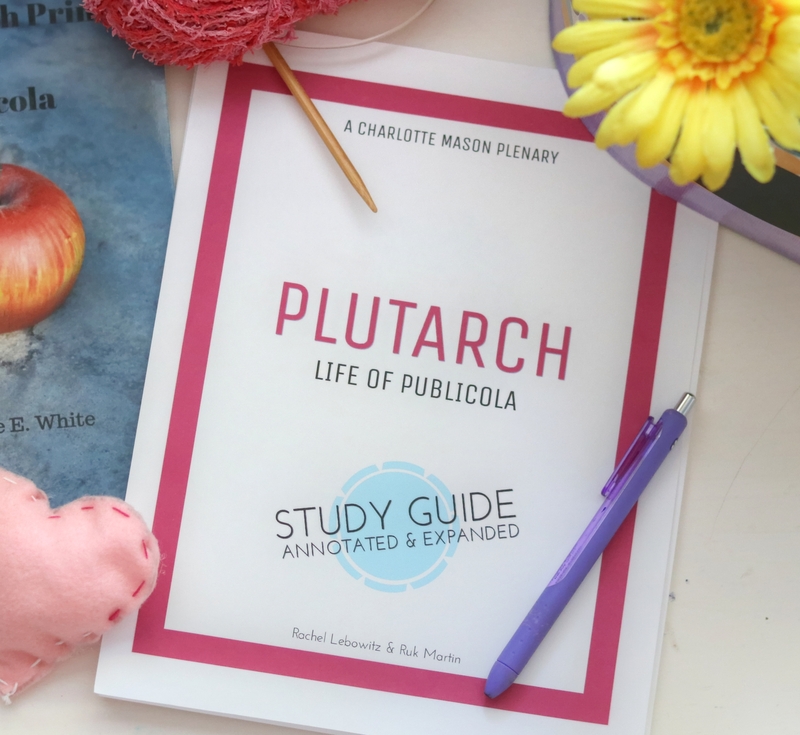 This first Plutarch guide covers the Life of Publicola. There’s a good chance you’re coming up short in your memory bank because Plutarch isn’t someone studied regularly these days. While Plutarch used to be considered a source which fell into “everybody’s reading” (everyone from Shakepeare to Lincoln read his works), you’ll now find his works are favored by (and sometimes only known by!) scholars and academia…and also by Charlotte Mason educators. The study of Plutarch was scheduled into CM’s schools beginning in Form 2A (our 5th grade) and that is where most of us following CM begin our Plutarch study. So who exactly was Plutarch? Plutarch was a Greek biographer who is famous for writing about the lives of the ancient Greeks and Romans. His most famous work was entitled Parallel Lives of Greeks and Romans (now known simply as Plutarch’s Lives) and it contrasted the life of one Greek with the life of one Roman. Typically his biographies were written about statesmen, generals and public figures such as Alexander the Great and Marc Antony. If you were to read all of his Lives, you’d find yourself well versed in the basic history of all of Greece and Rome up until Plutarch’s life (despite the fact that his book was written as a biography not a history). So why should we include Plutarch in our studies? Charlotte Mason was all about introducing our children to the people of history and giving our students the chance to witness character formation. Plutarch allows that. Plutarch wrote his Lives to include both a character’s strengths as well as his weaknesses. Plutarch doesn’t spell it out for us…he chronicles the lives of these famous men and then allows us, as readers, to make our own character assessments. We see how the small decisions shape the future and form our character because it is often from the tiny details of life that our character emerges. “…a man’s most brilliant actions prove nothing as to his true character, while some trifling incident, some casual remark or jest, will throw more light upon what manner of man he was than the bloodiest battle, the greatest array or armies, or the most important siege.” (from Life of Alexander) So essentially, Plutarch is a character guide, a training in moral development. So why a guide? And more specifically, why the CM Plenary guide? Charlotte Mason encouraged us as educators not to get between the child and the book. We are meant to prepare the lessons for our children and discuss with them after their narration, but we are not meant to limit what our children learn by making connections for them or pointing out every moral moment in a story. That’s all fine and dandy when my kids are reading something a bit less, um, difficult. But when it comes to Plutarch, I’m a fresh slate. I didn’t study Plutarch in school and I never read any of his works until Joseph began Plutarch this past year. And let me tell you, (regardless of which translation you choose!) Plutarch is a bit difficult to navigate as a newcomer. A guide is just lovely. Not for my students so much… but FOR ME. I am ashamed to admit it (although I know I am not alone in saying this) but without a guide, I probably would have quit Plutarch in the beginning…I just don’t have the background or the experience or even the practice of reading works like this to guide a conversation with my child. I needed help so I could succeed! The Plenary has included all kinds of useful tools…from vocabulary definitions to discussion questions to annotated notes. I appreciate that the vocabulary, notes and discussion questions are all in a sidebar, alongside the Plutarch text…no flipping back and forth to look up words or find side notes. At the beginning of the guide, there’s a Who’s Who page…very convenient for reference. The guide includes pronunciations of some of the names which is super handy so I don’t either a) butcher the name or b) have to grab my phone to look up the pronunciation. And the discussion questions proved to be discussion worthy; they didn’t simply ask for information recall, but rather gave Joseph and I thoughts to ponder and discuss. There’s also an appendix with relevant information included. The first lesson in the guide does an incredible job of giving us background information on Publicola, something we definitely lacked using the other guide. There was quite a bit going on that Plutarch assumed his reader knew (which naturally, I did not). The Plenary’s introduction lesson was vital in helping Joseph and I understand and appreciate Publicola’s story. The Plenary has also offered an incredible wealth of information on their Publicola help page which Joseph likes to browse through in his free time…some of the links they’ve included have really given us some insight into life during Publicola’s time giving us a more complete picture and while they certainly don’t replace the lesson (we don’t even use our lesson time to browse through the links), they definitely augment what we read during our lesson. One thing that sets the Plenary’s guide apart from most other Plutarch helps is that they chose to use the translation by George Long and Aubrey Stewart. This may not seem like a big deal to those of us who barely know Plutarch to begin with, but it is important in our studies. Long and Stewart translated it directly from Greek whereas the popular North translation was first translated into French by Amyot and then later North translated it into English so it’s a translation of a translation. Personally, I always like a first translation…it keeps what I’m reading closer to the original. North is a popular translation because Shakespeare himself used North’s translation in some of his plays. The Plenary plans to annotate the passages and quotes Shakespeare used with North’s translation so you won’t lose out on Shakespeare’s references. There’s a reason I personally really like Long and Stewart’s translation over North’s. It’s easier. Yep, I said it. We went through Publicola using Anne White’s guide first (she uses mostly North’s translation with a little of Dryden’s translation) and there was a lot of me reading and then retelling it to Joseph to give him a clear picture. He was getting lost in the language and he wasn’t retaining nearly as much as I would have liked between lessons. With Long and Stewart’s translation, I can read it to him directly from the text, and while it’s challenging and complex, Joseph gets it and he retains it. I find North’s translation more difficult to read than Shakespeare (and that’s saying something, right?! )…I relied heavily on Anne White’s guide and her summaries to explain what I was reading; with the Plenary’s guide, they are literally guiding me to get the most out of the text. Anne White even had to include “introductions” to each lesson where she recapped the last lesson…those summaries were important in helping Joseph and I journey through the text…we don’t need an introduction or a recap of the last lesson with the Plenary’s guide because Joseph understands the text so much more and he’s able to recap on his own. While I value reading complex language and challenging texts, I’d much rather read and understand a different translation than choose a translation that we spend our time struggling with and gain nothing from. Another thing that The Plenary’s guide offers that Joseph and I loved was the Epilogue. For Publicola, they wove Publicola into American History by connecting the Federalist Papers and the pen name Alexander Hamilton used to Publicola. I just can’t tell you anymore because the history is fascinating and you absolutely must read the epilogue yourself. It was a satisfying ending to our study on our first Plutarch life. All that being said, I’m surprised you’re still here and not over there checking it out. Here’s hoping your Plutarch studies are character building and full of virtue training and that you allow yourself the gift of The Plenary’s guide…you’ll be glad they’re holding your hand as you venture forth.